Land Transportation Office or LTO Imposed all vehicle Must apply for a new standardized plates motorists to renew the registration of their cars starting in February this 2015. Some motor vehicles that have already renewed their registration for January 2015 shall have the option of applying for the replacement in the next registration year at any LTO district office or at any time prior to thereto by going back to the same LTO district office where the renewal of its registration was last effected," explained by the Land Transportation Office. 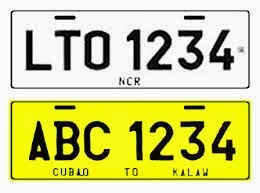 The new standardized plates, is worth P450, according to LTO . Availabilily of said the new plate , with the third plate sticker and plate locks after 45 days from the date of registration made . The owner of the vehicle will also responsible in installing their new standardized plate in their cars . However, the attachment of any unauthorized plate’s or any accessory or device to and or around the authorized motor vehicle license plate, or any manner of attachment that impedes in any way the visibility or reflectivity of the authorized motor vehicle license plate shall be strictly prohibited," warned by LTO. LTO added that the new record with three letters and four numbers will carry the same old plaque alphanumeric characters with three letters and three numbers. No Comment to " LTO Imposed All Vehicle Must Apply For New Standardized Plates This Coming February 2015 "